F. Pelegri, S. Schulte-Merker, A Gynogenesis-based Screen for Mternal-Effect Genes in the Zebrafish, Danio Rerio. P. Haffter, F.J.M. van Eeden, M. Granato, and J. Odenthal, Developmental Mutant Screens in the Zebrafish. C. Walker, Haploid Screens and Gamma-Ray Mutagenesis. J. Eisen, C. Beattie, D. Raible, and P. Henion, Early Pressure Screens. P. Hackett, Z. Ivics, and Z. Izsvák, Genetic Applications of Transposons and Other Repetitive Elements in Zebrafish. S. Lin, A. Meng, J. Jessen, Transgenesis. J. Postlethwait, A. Amores, A. Force, and Y. Yan, The Zebrafish Genome. J. Postlethwait, Mapping with RAPDs. E. Knapnik, Mapping with CA Repeats. D. Beier and D. Foernzler, Gene Mapping in Zebrafish Using Single-Strand Conformation Polymorphism (SSCP) Analysis. D. Ransom, Mapping with AFLP. Z. Gong, Zebrafish Expressed Sequence Tags and Their Applications. C. Amemiya, YAC, BAC, and PAC Libraries. A. Schier and W. Talbot, Positional Cloning of Mutated Zebrafish Genes. C. Kwok, R. Critcher, and K. Schmitt, Construction and Characterization of Zebrafish Whole Genome Radiation Hybrids. M. Ekker, F. Ye, L. Joly, P. Tellis, and M. Chevrette, Zebrafish, Mouse Somatic Cell Hybrids for the Characterization of the Zebrafish Genome. J. Postlethwait and A. Moares, Cytogenetics and FISH Analysis. M. Westerfield, E. Doerry, A. Kirkpatrick, and S. Douglas, Zebrafish Informatics and the ZFIN Database. L. Zon and S. Johnson, Strains of Zebrafish. H.W. Detrich and L. Zon, Centromeric Markers in the Zebrafish. P. Edwards, Zebrafish Website Listing. Subject Index. 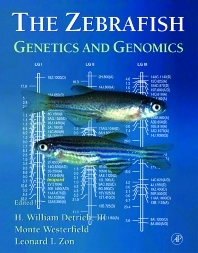 This is the second volume of a two-volume, comprehensive treatment of the methodologies used in researching the zebrafish, an emerging vertebrate model system. The text includes discussions on development, genetic methodologies, and model applications. Students and researchers who employ molecular, cellular, and genetic/genomic methods to study vertebrate development.